Calling all soldiers, airmen and the strong women behind them. Your town needs you. I am so super excited to be attending my first ever Gin Fizz event in a few weeks! Gin Fizz are a very unique and wonderful company who organise incredible themed ‘pop up’ evening club events in Milton Keynes. We are going back in time, all the way to 1942, to an air raid shelter where we will be leaving the rations at the door, hitching up our skirts, rolling our fringe and showing the world how to party the night away. 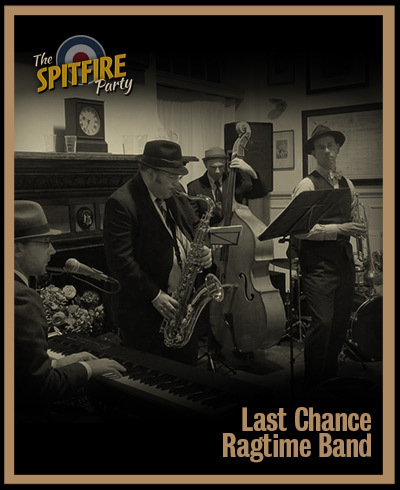 The evening will be hosted by Lili La Scala “The Songbird of Trafalgar Square” and there will be live music courtesy of The Last Chance Ragtime Band. 40’s attire is a must for this evening. If you struggle with the tiny details then don’t worry as on the night Sarah’s Do Wop Do’s will be there with her pop up beauty parlour. You can pre-book your quiffs, your fringe rolls or even go to town with a full vintage hair and make-up pampering. Oh and don’t forget to visit the photographer Monsieur M.Boumansour who will be waiting to capture you in all your wartime glory. Gin Fizz’s events always sell out before the night. There are some tickets left to buy for the evening so do hurry over to http://ginfizz.co.uk/ for more information and to secure yours fast. If you can make it – I’ll see you on the night and let’s DANCE FOR VICTORY!